This article discusses the inter-country adoption procedure, coupled with the relevant legislation to be complied with by foreigners seeking to adopt children from India. At the outset, it is important to emphasise that at present there exists no general law on adoption of children governing non-Hindus and foreigners. Adoption is permitted by statute among Hindus, and by custom among some other communities. 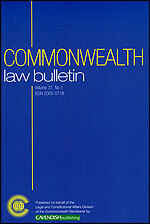 Quoting extensively from case law and legal provisions, this article examines the procedure to be followed in inter-country adoption from India and the role of the Central Adoption Resource Agency (CARA), the principal monitoring agency of the Indian Government handling all affairs connected with national and inter-country adoptions. In the section dealing with problems faced in Inter-Country adoption, the authors point out that: “At present non-Hindus and foreign nationals can only be guardians of children under the Guardian and Wards Act 1890. They cannot adopt children.” In conclusion, the authors call for an overhaul of the existing adoption law in India, not least, in the light of the growing demand for a general law of adoption enabling any person, irrespective of his religion, race or caste, to adopt a child. Electronic access is available to subscribers.